I spend a large part of the year in Asia, so this is one of my favorite periods of time. We’ve come off of the busy-ness of calendar year-end holidays and we’re approaching the end of the festivities of the Chinese New Year. The energy is great – people are having fun, celebrating with family, sharing oranges, and spirits are generally lifted! But, no matter where you are in the world, this is also the time of the year when one seemingly-universal phenomena has taken place: Those calendar year-end New Year’s Resolutions – which everyone was so intent on achieving on January 1 – have by now fallen by the wayside. The statistics around failed New Year’s resolutions are not pretty. 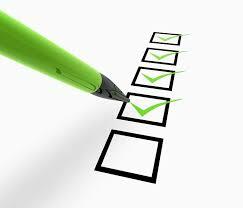 In 2013, Forbes magazine stated that only 8% of resolutions are actually met, which means 92% fail. U.S. News had a slightly more positive take, reporting in 2015 that 80% of New Year’s resolutions fail. 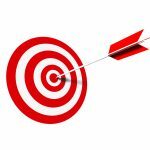 No matter which source you refer to, those are high rates of unfulfilled goals! What is the reason behind so many of us “falling off the wagon” when it comes to achieving what we wanted at the beginning of the year? 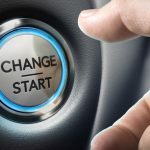 Multiple studies have tried to answer that question, but in my experience as an Executive Coach, I believe there is one critical yet overlooked cause of our inability to stick with what we set out to do. It’s not that we don’t want those goals to come to fruition. We definitely desire to lose weight, exercise more, be better organized, stop procrastinating, listen better, delegate more, and on and on. So, it’s rare that a lack of motivation is the true cause of resolutions going off track. Instead, I believe the heart of the issue is our belief that if we just “do” things differently, all will be well. For example, I often hear, “Once I get my calendar under control, I’ll be more productive.” Or, “Once I make more money, I’ll be happier.” Maybe you’ve made a similar statement in the past? 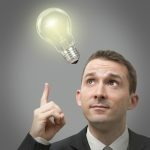 But, in my experience coaching executives across the globe, those types of “if-then” statements rarely become reality. 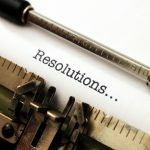 And, when you don’t achieve your resolutions, you’re likely to feel more angst and frustration than you did before … not to mention feelings of failure. That just makes it even harder to set and achieve new goals in the future. 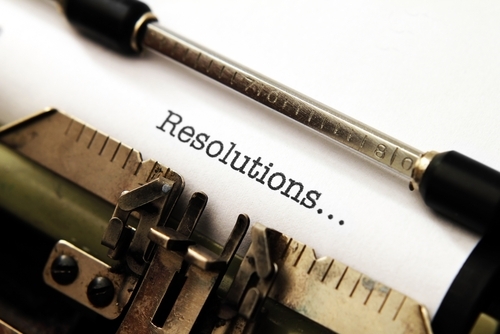 So, what do I think is the biggest reason that such a large percentage of New Year’s resolutions aren’t achieved? It’s because the types of goals we set tend to focus on what we hope to “do” rather than how we need to “be” to achieve what we want. We must first change how we are “being” before we can truly alter what we’re “doing.” After all, we are human beings, not “human doings,” right? Let’s look at an example: Put yourself in the shoes of a leader at work. 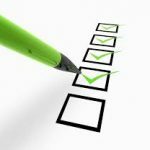 Your stakeholder feedback reveals you have a tendency to “tell” more than “ask,” and this behavior is having an impact on your success. Since you’re simply “telling” your team what to do, they aren’t developing as they should. If you asked powerful questions instead, you would develop their thinking and leadership capacity. You’ve been told that your own career will stall if you keep this up because you won’t have developed a successor who can take your place. 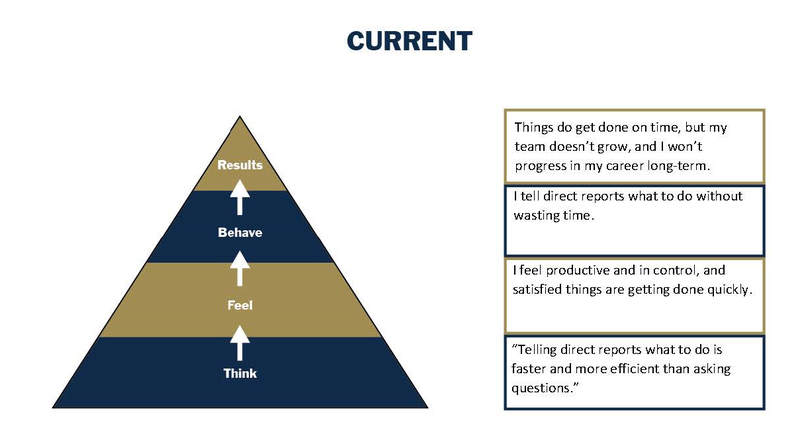 So, this behavior is not only preventing your direct reports from moving up, but it will also hold you back from moving up progressing, too. Knowing this, you’re now very determined to make this change! You set a goal for yourself to ask more powerful questions rather than to tell subordinates what to do. You even go so far as to establish a measure – you’ll ask 60% of the time and tell only 40% of the time, at least as a start. (That’s a big shift from where you are now, which is 90% telling and 10% asking). At first, you do well with changing your telling and asking behaviors. But then, pressure builds up at work, and you think it takes too much time to ask. So, within weeks, you’re back to your old self, telling your subordinates what to do 90% of the time. You’ve gone full circle, and you’re back where you started. The goal of “telling less, asking more” is an example of a “doing” goal. If you only stay at that level, you haven’t yet reached the crux of the issue. It’s fundamental to ask yourself: What is at the core of my need to tell so much? That core is about how you are being, feeling, and thinking. At the heart of every desired change in behavior is a deeper state of “being” that must first be addressed. and a strong desire to get things done quickly because you believe it takes less time to tell someone what to do. Let’s work through this second perception. How can “being,” feeling, and thinking differently result in different outcomes that create long-lasting, positive change? My client, Augustina, always wanted to get work done quickly, and felt that telling her direct reports how to do it (as opposed to asking them to discover ways to do it for themselves) was a more efficient way to meet deadlines. 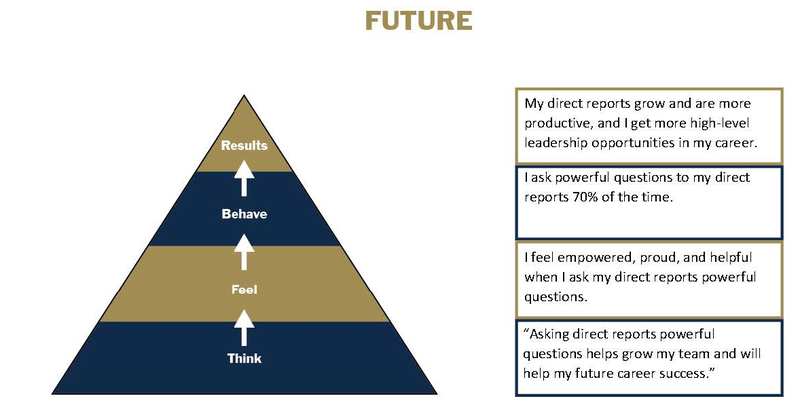 So, we addressed this issue with the use of my “Think-Feel-Behave-Results” triangle below, starting from the bottom and working our way up. “So, how does that emotional reaction make you behave? What are the actions you take as a result?” I asked her. “I quickly tell direct reports what to do without wasting time,” Augustina responded. When I asked her to sit back and reflect about the overall impact of this behavior on her individual brand as a leader, she admitted that this probably made her look like an ineffective leader. She agreed that wasn’t the outcome she wanted. “I feel empowered and proud. It feels good to think of being helpful by asking my direct reports powerful questions, and it certainly feels good to be more successful myself,” she said. Identifying the feeling helped Augustina begin to behave differently than before. She would ask powerful questions far more often, no matter how much time it took. The ultimate result? Her direct reports would grow in their roles, which would lead to increased productivity, and Augustina’s ability as a leader would improve and be recognized, too. That, in turn, would end up providing more career opportunities for herself. By simply changing the way Augustina was being and thinking about a limiting behavior, and by changing her feelings about that, she could immediately become a stronger leader. This would, in turn, improve her leadership brand. Walk through the triangle exercise, from bottom to top, asking yourself about your thoughts related to a challenge you’re facing. How does that specific thought make you feel? How does that feeling cause you to behave? What outcomes does that behavior have on your success and on your brand as a leader? Sit back and reflect on how that underlying thought – how you are being – is impacting the results you get. Then, work your way through the triangle a second time, this time thinking a positive, forward-focused thought about that same challenge. How does this new thought make you feel? How would this feeling make you behave? What result would you get from this new behavior? 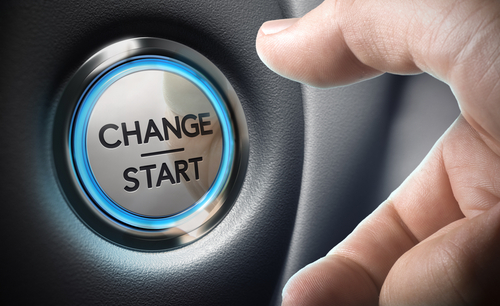 Changing the way you are being and the thoughts you have create a powerful shift that will drive positive, long-lasting change. Make a commitment to yourself that the next time a challenge arises in the workplace, you’ll remember to think differently about that challenge, and alter the way you are being/thinking/feeling. Ultimately, that’s what will result in greater short- and long-term outcomes … and, yes, successfully achieving your New Year’s resolutions! This is a very common question I get asked when working with leaders in my Executive Coaching practice. If this resonates with you, too, click here to listen to a radio interview I did a few months back. 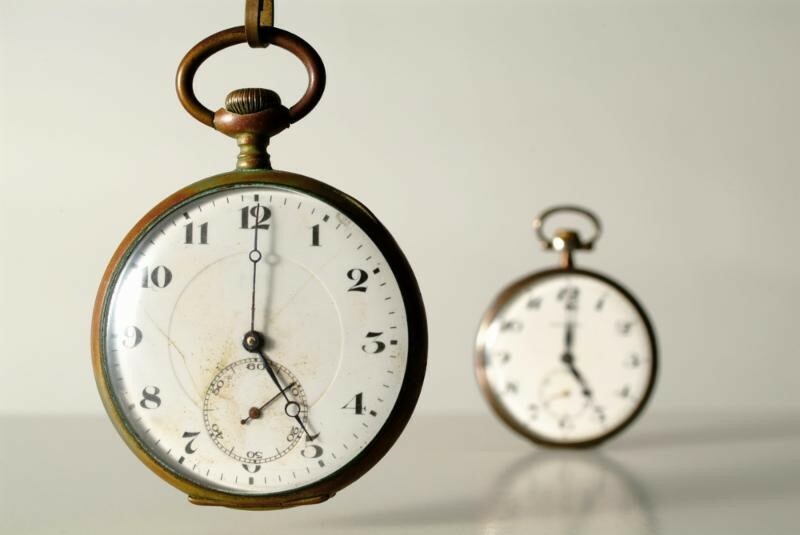 As a guest on Robyn Pearce’s “Getting a Grip on Time: Do More With Less” show, I shared a number of useful tips, tools, and techniques you can use to take charge of your time and gain back better control of your personal and professional life.